The story of Mary Queen of Scots and her cousin Queen Elizabeth I is a familiar one having been dramatised on a regular basis. Josie Rourke's big screen version is a modern take on the period story of a power struggle, two neighbouring queens ruling their respective countries in a man's world. Rourke's background is in the theatre rather than in film. She is the Artistic Director of the Donmar Warehouse, a smallish theatre in central London which punches well above its weight attracting major stars. Her theatrical background is steeped in the likes of Shakespeare which means that she is familiar with period drama featuring kings and queens, and here she directs a screenplay by Beau Willimon which in turn is based on the book "Queen of Scots: The True Life of Mary Stuart" by John Guy. 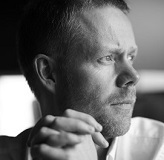 For the music Rourke has gone to composer Max Richter to create the film score, and this does seem like a canny choice given Richter's track record with both classical and modern music idioms. One of Richter's best selling albums is his "Recomposed" version of Vivaldi's Four Seasons. 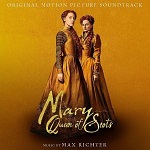 Indeed true to form, Richter has sought classical inspiration to inform his score for "Mary Queen of Scots". The opening strains of the first track "The Shores of Scotland" present an introduction to the main theme with rising string arpeggios against a drum rhythm. This immediately suggest the opening to Handel's "Zadok the Priest" a work frequently performed at Royal events including Coronations. But the music diverges from these expectations and introduces the main theme as a plaintive Nymanesque melody on the cor anglais. Of course Handel's music was not heard in Britain until a hundred years after the Tudors but in keeping with the film's goal, the intention is not to be authentic to the period but to support a retelling of the story for modern audiences. Thus the music gives a period feel and is true to the Royal subject matter, while still supporting the film's lavish production values and translating the drama into 21st century terms. A harp figure makes an appearance in "Elizabeth's Portrait" before string arpeggios return. The combination of string arpeggios and slower melody line recurs too in later tracks and becomes a score-defining feature. A repeating drum beat underpins "A Claim to the Throne" as string figures rise to a climax before receding, while a closer degree of authenticity appears in track 4 with Thomas Tallis' four-part motet "If Ye Love Me". "The Poem" also features harp with various figures which become a simple folk melody with a combination of sustained and pizzicato strings. "Darnley's Visit" sees a return of the Regal cor anglais theme from the opening track, emphasising that this is Mary's theme. The music takes a sinister turn as events unfold in "The Wedding" and "Knox" and a sombre mood permeates "Rizzio's Plea", "The Ambush" and "Pray For Me" while both "The Hilltop" and "A New Generation" present a brighter mood with a reprise of Mary's theme from "The Shores of Scotland". "The Assassination" is a hymn for strings before an elegaic theme emerges from "The Finale" before it resolves to the strains of Mary's theme. The outcome of this drama is all too familiar and inevitable. The female leads imbue their regal characters with a combination of power and grace, while Richter provides highly effective accompaniment using a minimal yet well-crafted and expertly deployed set of musical tools. The film score album is available from Amazon.co.uk or Amazon.com.